Pixelache | Back from LabtoLab! News : Back from LabtoLab! 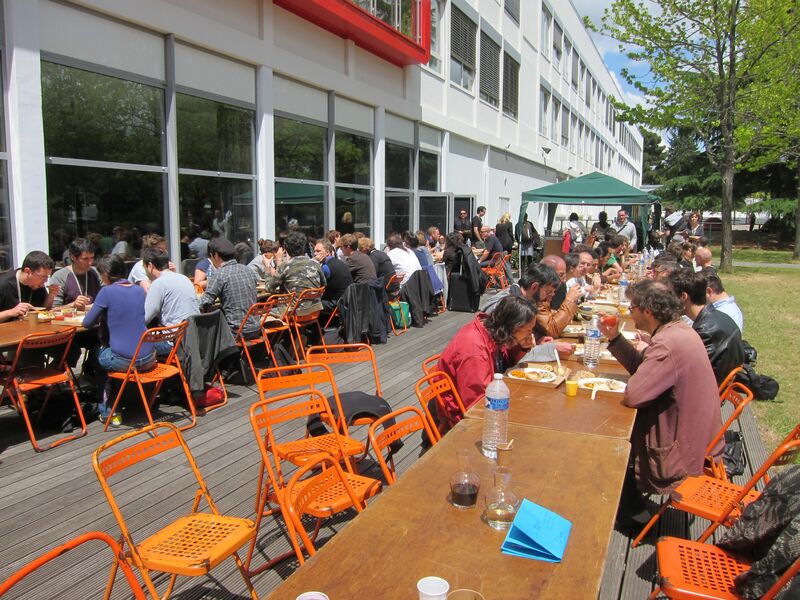 Part of the Pixelache crew traveled to the LabtoLab event (8-10 June) in Nantes, France. LabtoLab is a network of media labs initiated by Constant (Brussels, Belgium), Kitchen Budapest (Budapest, Hungary, Medialab-Prado (Madrid, Spain) and PiNG (Nantes, France). During the past 2 years, through meeting, workshops and seminars, they have developed a platform for reflecting and expanding the notion of the contemporary ’media lab’ and examining the possibilities of life-long learning in the context of the lab. Each encounter opened up to a wider community of labs and individuals, and extended beyond European borders.' The meeting in Nantes was the wrap-up point of a 2-year process and a space for planning how to continue from there, gathering about a 100 participants from Africa, Asia, Southern and Northern America and Europe. The connection between LabtoLab and Pixelache, started from the Helsinki visit of Catherine Lenoble from PING in 2009. Catherine was interested in Pixelache as an organisation and she spent one week meeting different members of the local Pixelache community, as part of her comparative case study for a nomadic pan-European training program on cultural cooperation. Many things have happened in between, but an undirect and concrete outcome of this was the extended collaboration that took place between LabtoLab in Nantes and Mal au Pixel this year. This shows the importance of also meeting people outside big events and the worth of creating different methods / frameworks, like micro-residencies or 'learner' residencies, to exchange knowledge, get to know each other and develop collaborations. LabtoLab and Mal au Pixel accidentally happening around the same dates, ended up doing a lot programme planning together and sharing a huge amount of resources. 20 people originally invited to participate in Mal au Pixel, were given the possibility to participate in the LabtoLab event; the LabtoLab translators came over to Mal au Pixel, to name but a few examples. That's something we have been trying to do at Pixelache in collaboration with other events in Helsinki or in the region, but on a much smaller scale so far, so seeing this happen on such a scale was very inspiring. And it especially makes sense when a large part of the participants come from distant countries, as its often the case also in Pixelache. So bravo LabtoLab and Mal au Pixel! As in many other events that work essentially as meeting places for professionals, informal discussions and sessions took place, but LabtoLab really managed to put a lot of people to work and share the results of this work over a couple of days. 4 working groups were set up on the first morning to reflect on the notion of 'lab' around 4 themes (Residency as a Lab, Co-documentation, Medialabs & University, Networking Open ateliers). A wiki sprint took place to update the definition of 'media lab'. On the last morning, a plenary feedback session where the results of the discussions were shared was held (more documentation will be put up on the LabtoLab pages soon). LabtoLab also clearly invested in hospitality. Food was excellent and the people taking care of the catering, very informally organised before the event, used the event to start a more sustainable activity and create a cooperative. It's great if an event can produce such nice side effects. The morning activities took place in the premises of PING and the afternoon programme was organised everyday in a different location. Together with architects and landscape architects, PING printed alternative maps for people wishing to take a walk through the city while heading for the next event. As this was an integral part of the programme, many participants took the chance and got some fresh air while discovering Nantes. This was quite appreciated as so many times when participating in events, one doesn't get to see much outside festival venues. These convivial moments are in the end what people really remember and give an added-value to the rest. That's really something to keep in mind always when organising events!